If you're looking for a Smarter way to address your cold storage needs, save money on energy costs, reduce overhead and have a positive environmental impact, Cold Air Refrigeration and Ricker Thermline are the businesses to consider. Located in Concord, California, Ricker Thermline and Cold Air Refrigeration have over 50 years of combined experience specializing in the construction of well-engineered temperature controlled facilities throughout California and the United States. 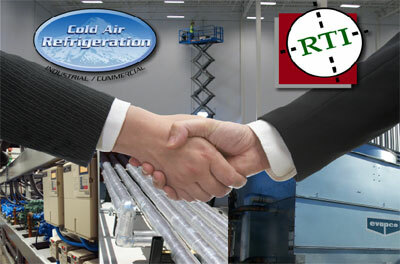 Working together, Ricker Thermline and Cold Air Refrigeration custom design the right solution for your business needs. Ricker Thermline has the experience and background to create the right solutions specifically designed to meet each customer's unique needs. 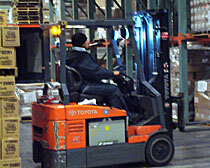 Ricker Thermline and Cold Air Refrigeration have custom designed the most energy efficient, computerized refrigeration systems available today. Cold Control Systems use variable frequency drives to regulate the speed of the compressor motors, dramatically reducing energy use and costs. This variable speed controls system works like a cruise control in your automobile, only adding the exact amount of power needed to meet the current demand. Traditional refrigeration systems use on/off compressor cycling to maintain room temperature which creates huge energy spikes. The energy company charges for these spikes in the form of peak demand charges. Additionally, the on/off cycling is hard on equipment and causes larger temperature fluctuations. Another advantage of the Cold Control system is that it can be monitored from anywhere in the world where there is an Internet connection. This allows you to connect in real-time with the Cold Air Refrigeration control system. In addition, most energy providers offer rebates that will further reduce your initial installation cost, allowing for an even quicker return on your investment. 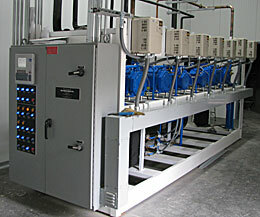 With a Cold Control computerized refrigeration system the benefits are numerous. Quick Return On Investment through huge energy savings. Bottom Line: Ricker Thermline and Cold Air Refrigeration specialize in thermal solutions that have a significant impact on your businesses profitability and the environment. Saving money and going green couldn’t be easier or better for your company. Smart Technology, Smart Investment, Smart Choice, Ricker Thermline. 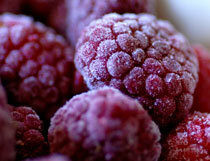 Cold Air Refrigeration; the SMARTER way to address your cold storage needs!